Keira Knightly is in the trailer of this movie getting spanked and saying in broken English that it excited her. 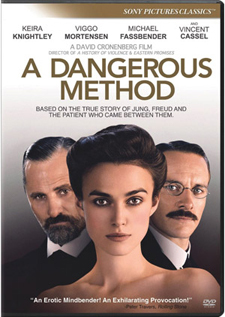 And this movie was called “A Dangerous Method.” That is how you sell a movie, ladies and germs. OK, so all of this really happened. There was Freud and Jung and this female patient turned doctor who brought the two together and tore them apart. There was some infidelity and questions about what was infidelity and quite frankly a lot less spanking than I was led to believe. And I think they told Keira Knightly to try to be as unattractive as possible.